Published in shorter form in TimeOut Mumbai, 25 April 2013. This new book by American journalist and writer Daniel Brook is an essential addition to the bookshelves of anyone interested in how cities like Mumbai both aspire and attempt to fulfill ambitions of becoming global and modern metropoles. An adventurous narrative of St Petersburg/Leningrad, Shanghai, Bombay/Mumbai and Dubai, embracing more than three hundred years of modern history, Future Cities is a refreshing comparitive account of global cities outside of their nation-states. Brook romps through the take-off periods of St Petersburg in the 1700-1800s, Shanghai and Mumbai in the late 1800s and early 1900s, and Dubai in the late 20th century, comparing the growth of these custom-built “gateway cities” in Russia, China, India and the Middle East. These “windows to the world” were purposely created to expose and reform their backward peasant and colonial populations to modernity and globalisation. By contrast with their inland bureaucratic capitals – Moscow, Delhi, and Beijing – these novelties contrived by reforming emperors, merchants, and imperialists created new settlements and lifestyles by importing and imitating the latest “Western” forms of architecture, industry and public life. Dubai makes a late appearance in Future Cities as the contemporary template for the port cities which rulers in Russia, China and India built to upgrade and modernise their backward subjects. This late-20th century “instant city” made possible by oil wealth, air-conditioning, airline travel, and global migration, provides Brook’s bookends for his longer histories of port cities, which turned inward – towards their national hinterlands – in the late 20th century, precisely when Dubai embraced free-wheeling global capitalism and urban cosmpolitanism. 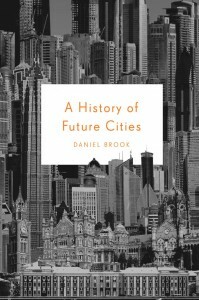 Future Cities remains a delicious read, though Brook’s history is riddled with contradictions which may discomfit more serious scholars. While bemoaning the decadence of the foreign elite who kept native Chinese at an arm’s length in interwar Shanghai, he hails the “pith-helmeted army” of Britishers in the Bombay Improvement Trust (BIT) who ruthlessly rebuilt Mumbai’s inner-city, demolishing homes of thousands more than could be re-housed in its chawls (with a lasting legacy for today’s “slumdogs”). His sweeping treatment of how Leningrad, Shanghai and Mumbai snap shut their “windows” under communism and the License Raj, only to be pried open by liberalisation and global capitalism, glosses over much of 20th century political and social history in Russia, China and India. Brook’s reliance on second-hand studies account for the many gaps in his history, especially for Mumbai, where he rehashes the sepia-tinted nostalgia of heritage conservationists, and simply skims academic histories of labour and urbanisation. Brook’s introduction, on how “Westernisation” drove the aspirations of his Future Cities over more than 300 years, quickly spreads thin in nearly 400 pages, narrating the kindred birth but divergent trajectories of St Petersburg, Shanghai, Mumbai and Dubai. Though lacking in scholarly rigour or fresh research, this is is made up for by Brook’s fluent prose style and his flair for story-telling. Future Cities is delightful thanks to Brook’s keen eye for detail – especially of urban design and built forms – and his talent for comparing and connecting far-flung places that anchor a common world history. Indeed it is only towards the end of the book that the chapters on the four cities are woven together to challenge the East-West dichotomy with which he introduces Future Cities. Russian petro-capitalists seek to mimic Dubai in refashioning the skyline of St Petersburg, just as Indian politicians obsessively try to remake Mumbai in the image of Shanghai, without reference to Europe or America. The “West” – wherever that is – is less an ambition to mimic foreigners, than an imagination of how to be modern and contemporary in a fast-changing world.